ADVANTAGE plate heat exchangers isolate tower water from the water in contact with your processing equipment to keep your processing equipment clean and maintenance to a minimum. ADVANTAGE plate heat exchangers consist of a number of stainless steel transfer plates that are held in place between a fixed plate and a movable pressure plate to form a complete unit. Each heat transfer plate has a gasket arrangement that provides two separate channel systems. The arrangement of the gaskets results in through flow in single channels, so that the primary and secondary media are in counter-current flow. The media cannot be mixed because of the gasket design. The plates are corrugated, which creates turbulence in the fluids as they flow through the unit. 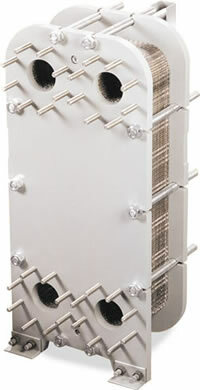 ADVANTAGE plate heat exchangers allow for plate cleaning without disconnecting process piping. To & From Process : 4"